A replica of the Marquis de Lafayette’s frigate Hermione is on its way to America’s shores for a “Re-Living History” sail with a scheduled June 5 landing in Yorktown, Va. In commemoration of the April launch, President Barack Obama issued a letter celebrating “the enduring bonds of friendship and solidarity that bind” France and the U.S.
Lafayette College is hosting a series of College-wide events at five of the 11 ports of call along the Eastern seaboard. 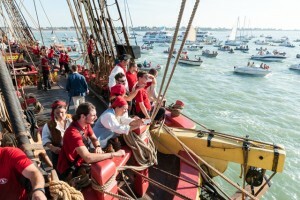 Visit the College’s Hermione site for information about touring the ship, registering for College-related events and details at each port of call. 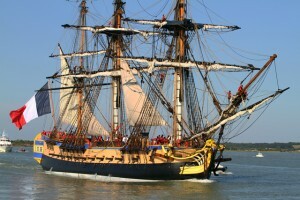 The authentically reconstructed Hermione, 17 years in the re-making, set sail from the mouth of the River Charente, in Port-des-Barques, where Lafayette boarded the ship in 1780 with a message informing Gen. George Washington of France’s decision to aid the Americans in their fight against the British. France’s involvement helped turn the tide of the American Revolutionary War. And when Lafayette returned in 1824 for his final visit to America 44 years later, the citizens of Easton were inspired to name the new college they were founding after the heroic French general. While many streets, roads, and cities bear the Marquis’s name, Lafayette College is the only higher education institution named in his honor. The Hermione will travel 3,819 miles across the Atlantic arriving at its first stop June 5 in Yorktown, Va., where it took part in the blockade that led to the surrender of Lord Cornwallis and his army. Then it’ll sail up the coast, stopping at Alexandria, Va.; Annapolis; Baltimore; Philadelphia; New York; Greenport, New York; Newport, Rhode Island; Boston; Castine, Maine; and then Lunenberg/Halifax, Nova Scotia; before heading home to France. Lafayette, a strategic partner with Friends of Hermione-Lafayette in America, is holding events for alumni and the entire College community in Alexandria, Annapolis, Baltimore, Philadelphia, New York City, and Boston. Prints, paintings, and manuscripts from Skillman Library’s Marquis de Lafayette collection will be featured during exhibitions at the New York Historical Society and the Boston Athenaeum. A photographic exhibit in Skillman’s Lass Gallery of the ship’s construction will run through Sept. 11 and include a speaker involved with the building of the ship. The Hermione was constructed by a French ship builder using almost entirely 18th century ship-building techniques. Two thousand oak trees had to be found for 400,000 hand-sculpted pieces for the hull, techniques had to be reinvented, forges re-kindled, and artisans from all over the world enlisted. This summer’s event has been a long time in the making but seems a most relevant time with the developments in the world today, says Miles Young, president of Friends of Hermione-Lafayette in America and worldwide chairman and CEO of Ogilvy & Mather. Can I get this poster of the Hermione? Is it possible to visit the ship in July ll 0r 12th ? will it be ope with tours, etc. at Rowe’s Wharf? Thanks for any info. I’d like to visit, meet the young sailor in mariner 18th century dress. this is fascinating and exciting. I want to be at the celebration in Boston on July 11. Please send me details and what we might expect that day. Do you need any help? This is just plain beautiful at so many levels!